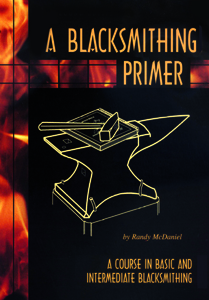 This is the companion video to "the blacksmithing bible", A Blacksmithing Primer. The author of the indispensable reference book appears in these videos, teaching the standard techniques that all blacksmiths must know to master the craft. This is a must-have for every blacksmith's video library! You will learn how to organize your shop, build your first fire, hold and use your hammer, choose your stock, make tools for any job, forge weld, make scrolls, hinges, how to make animal and human heads and much, much more. Randy's simple, straightforward and humorous approach to learning to be a good blacksmith is as much a part of these videos as it is his book. Shot and edited in the same clear, user-friendly style you have come to expect from Love of Art Productions, you will enjoy watching Randy demonstrate all the techniques close-up, just for you. This is a three tape/ DVD set, with almost 6 hrs of learning. You won't find a better resource for the beginning and intermediate blacksmith.